You are here: American University School of Communication News Can Augmented Reality Build Stronger Cities? Can Augmented Reality Build Stronger Cities? How did five cities repurpose Pokémon GO, including to deepen a sense of place or enliven civic life? What was the range of impact? For the future of cities, what do these experiments raise in terms of big picture provocations, strategies, and questions? 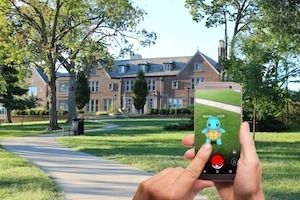 The research, already underway, will include in-depth interviews and onsite visits to several cities for Pokémon GO partnership events, including Akron, Ohio; San Jose, California; Charlotte, North Carolina; Boston, Massachusetts; and Philadelphia, Pennsylvania. The research findings will be published in an open-source white paper in 2018, as well as a series of blog posts. Findings from the research will also be presented at conferences with city leaders and scholars. “Pokémon GO seemingly is a straightforward game, but there is some surprising complexity in how social interaction happens around it and how the game might intersect with the local civic organizations. It is opening up some really big questions about the future of cities and I think that is exciting,” said Stokes. “At the Center for Media & Social Impact, we are constantly interested in, and engaged with, understanding the role of civic, community storytelling in fostering public engagement with issues that matter. We’re thrilled with this innovative new work and anxious to build upon it in future efforts with Benjamin,” said Caty Borum Chattoo, director of the Center for Media & Social Impact. This collaboration will play out at community events in several cities, including in “Open Streets” events. These events temporarily close the streets to traffic so people can use them for walking, bicycling, dancing, playing and socializing. City assets from parks to libraries will also be used to bring together people of diverse backgrounds and build a sense of shared community.